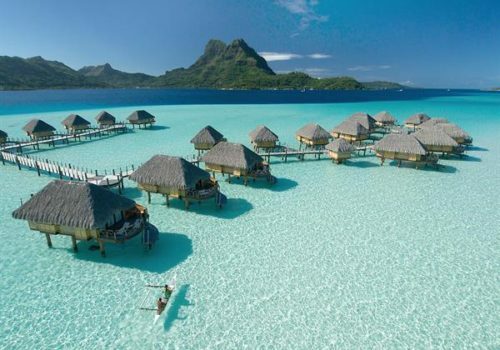 Set on the tranquil turquoise waters of Bora Bora in French Polynesia, this luxury 5-star resort’s villas boast authentic Polynesian style and architecture and offer some of the most traditionally designed rooms and villas in Bora Bora. Enjoy vichy shower body scrubs, hot stone massage with fragrant ‘monoï’ oil, or the local ‘taurumi’ massage, at the resort spa. Explore the aquatic wonders of the region facilitated by the resort by taking part in a water based activities such as stand up paddle boarding, kayaking, outrigger canoeing, and snorkelling. Take a 4×4 safari tour and discover the remnants of American World War Two military installations, or take advantage of the numerous sporting facilities that include a tennis court, mini golf, ping pong, pool table, volleyball, pétanque and a fully air-conditioned gym. The End of Pontoon Overwater Suites have been recently remodeled to offer additional comfort and amenities such as Nespresso machines, Ipod docks and larger TV screens, Direct Access to Lagoon, Bathtub with Separate Shower, Furnished Sundeck and Gazebo. Tucked away in the resort’s lush tropical garden, the Garden Pool Villa is the largest room category with 871 sq ft. Located closer to the end of pontoon with delightful views of the lagoon and the beach. 667 sq ft are split between a spacious bedroom area with an en-suite bathroom complete with a bathtub and separate shower, a sundeck with gazebo and direct access to the lagoon, glass top bedside and coffee tables, as well as glass top by the bathtub, Direct Access to Lagoon, Bathtub with Separate Shower, Furnished Sundeck and Gazebo. deally located right on the beach, the Beach Suites (786 sq ft) built in Polynesian architecture and style, are enclosed in their own private garden and feature a spacious bedroom area and an indoor as well as outdoor shower, comfortable living room opening onto the beach and dazzling views of the lagoon, majestic Mount Otemanu, and a jacuzzi. With unparalleled views of iconic Mount Otemanu, they are amongst the most popular categories at the resort. The 667 sq ft are split between a spacious bedroom area with an en-suite bathroom complete with a bathtub and separate shower, a furnished sundeck with gazebo and direct access to the lagoon, glass top bedside and coffee tables, as well as glass top by the bathtub. The lead-in Overwater category, they are located closer to the shores. The 667 sq ft are split between a spacious bedroom area with an en-suite bathroom complete with a bathtub and separate shower, a furnished sundeck with gazebo and direct access to the lagoon, glass top bedside and coffee tables, as well as glass top by the bathtub. 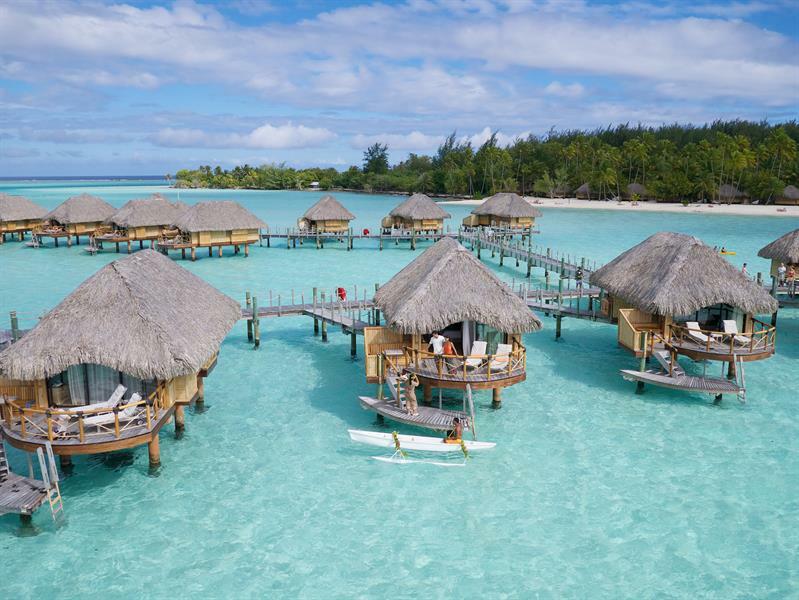 Poised on Motu Tevairoa, only a ten-minute boat ride from the airport and fifteen minutes across the lagoon from the village of Vaitape, the Bora Bora Pearl Beach Resort & Spa combines is conveniently located near the mainland. Some excursions in Bora Bora are not to be missed and the favourites include: ray and snorkel adventure, full day tour with snorkelling and beach picnic on a secluded ‘motu’ islet, jet skiing around the island, or sunset glide onboard the Solar Okeanos Pearl, a zero emission deluxe catamaran, exclusivity of the Bora Bora Pearl Beach Resort & Spa. The resort has been awarded a number of international awards by TripAdvisor, Booking,com and Conde Nast Traveler Readers’ choice.All rooms and suites have been built with the Polynesian way of life in mind, offering space, large windows and lovely open air areas. They are air-conditioned and offer all modern comfort such as cable television and complimentary Wi-Fi. From delicious grilled fish or meat to the island’s speciality ‘poisson cru’, paninis, colourful salads or tasty pasta and pizzas, options at the Miki Miki Restaurant abound for your palate’s pleasure. Enjoy a selection of tantalising sushi and sashimi in the cosy setting of Taurearea Sushi Bar. Whether your dream is to have breakfast delivered by outrigger canoe to your overwater bungalow, dinner served on the beach or on your overwater deck, these can be arranged with the on-site Concierge & Activities desk. Tevairoa features international cuisine with a creative French-Polynesian touch. Every Monday, enjoy a vibrant live Polynesian show.